A grateful mum whose son required emergency lifesaving treatment after he was born seriously ill will be running the Virgin Money London Marathon to raise money for The Sick Children’s Trust. Mum of three, Susan Lea, 40, from St. Neots, will be taking on her first marathon on Sunday 14 April in a bid to raise £5,000 for The Sick Children’s Trust to thank the charity for giving her and her family free ‘Home from Home’ accommodation when her son, Jasper, required lifesaving treatment miles away from home. In August 2017 Jasper was born, floppy and unresponsive, at Hinchingbrooke Hospital. Susan had undergone an emergency caesarean after suffering from a prolapsed umbilical cord during labour. Jasper was diagnosed with severe hypoxic-ischemic encephalopathy (HIE), a brain dysfunction caused by a reduction in the supply of oxygen to the brain and other organs. 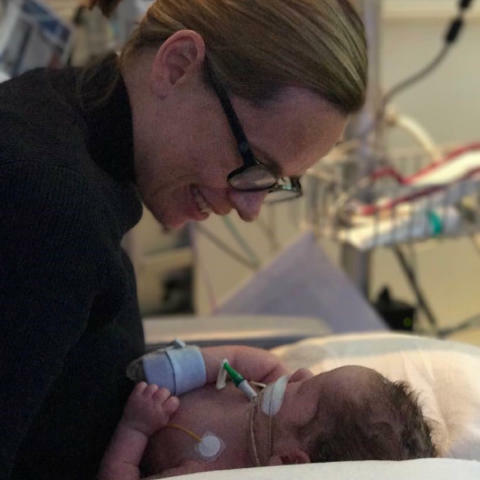 In a bid to save his life, Jasper was rushed to The Rosie Hospital in Cambridge where he underwent 72 hours of specialist cooling therapy on the neonatal intensive care unit (NICU) in an attempt to reduce the level of brain damage. For the six weeks that followed, Susan and her husband, Alex, were supported in free ‘Home from Home’ accommodation at Chestnut House run by The Sick Children’s Trust. “As Jasper left with Alex for Cambridge just hours after he’d been born, I had to deal with the horrible reality that I might not see my baby ever again. Fortunately, the next day a bed was found for me on the maternity ward in Cambridge so I could be reunited with my son and two days later - when I was discharged - I moved into Chestnut House with Alex. At this point, when he was just a few days old, we were told Jasper might not survive the weekend. His condition was so severe that we were advised not to leave the hospital in case we were not able to get back to him in time. Having a room in Chestnut House meant we could stay with Jasper, making all the difference during the worst days of our lives. Miraculously Jasper survived the first weekend of his life and spent a further six weeks on NICU at The Rosie Hospital before he was transferred back to Hinchingbrooke. Two weeks later his parents were able to take him home. Susan is joining #TeamSCT this year and hopes to raise £5,000 to help the charity continue supporting families across its ten ‘Homes from Home’. She is asking her friends and family to make donations to the charity at her 40th birthday celebrations this month. “I am really stuck into my training programme and can be found up and running at 5.45am most mornings. Obviously, as mother to three young boys and with a full time job, I am incredibly busy and training is taking up a lot of time. The Sick Children’s Trust runs ten ‘Homes from Home’ across the country, giving families with seriously ill children in hospital free accommodation just minutes from their child’s bedside. The charity relies entirely on voluntary donations and it costs £30 to support a family for one night. “We’re delighted to welcome Susan on to #TeamSCT and she has set herself an incredible fundraising target of £5,000! “On site ‘Home from Home’ accommodation is vitally important to the emotional well-being of any family with a child in hospital, especially for families like Susan’s who were told it was unlikely Jasper would survive the weekend. To have had to make the daily two hour round trip would not have been an option.